As the past few snippets have been, here’s another one from MONTANA MOON. I’m up to almost 27K words now. There’s a little unfinished business–like making love, the black moment, some action, another black moment, and then the HEA. Because this is romance and the HEA is guaranteed. In this scene, Tait was hurt, yet he’s healed remarkably fast. Our intrepid couple have made it back to his cabin. Now her eyes went wide and a snarl curled her upper lip while her hands flailed around her head. The damn woman shouldn’t be so cute when she was angry. Tait folded his arms across his chest, waiting for her rebuttal. She sputtered a few times, starting to speak then stopping as words failed her. She tried again. “You’re giving me bad movie lines now? Seriously?” Lauren stomped over, stopping directly in front of him. Her fingers curled into his T-shirt of their own accord, like they knew what to do even if she didn’t. “You think I’m some sort of lightweight? Ha! The stuff I know would curl your hair.” She blinked a few times as she considered his close-cropped thatch. “Well, it would if your hair was long enough.” Her voice caught on the last word and she looked away. Lauren thumped his chest, careful to land her fist closer to the shoulder opposite his injury. “You could have died, Tait. Because of me.” The words tumbled out, breathless and coated with worry and fear. He tasted both on the tip of his tongue and inhaled the odors with each breath. Onions and ammonia. Not overwhelming. Yet. Her fingers clutched convulsively in his shirt but he fought the urge to wrap his arms around her. Her lashes swept down to cover her blue eyes a moment before her head thunked against his chest. “I don’t know,” was her mumbled reply. “I shouldn’t. I don’t know you. And you don’t share anything about yourself. But—” She melted against him. And with those words, methinks the man has tempted Fate just a little. So, do you have any light words to share? Any suppositions on where Tait and Lauren are going to end up after this scene? 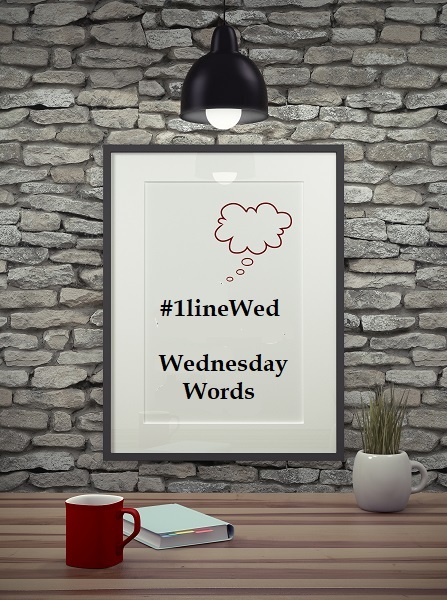 This entry was posted in Writing Life and tagged #1lineWed, Brotherhood Protectors, characters, fun stuff, inspiration, Kindle Worlds, quotes, snippet, Wednesday Words, WIPs, writing. Bookmark the permalink. I am between words right now. Purposefully not thinking about my own words anyway. Until Monday when Early Grave is due back from JC. Your words, however, are awesome. Since he’s injured and worried about her, she’ll end up asleep, curled in his lap in front of the fire. I have my fireplace all set up to light after the basketball game tonight, to be lit when we get home! I have a tasty Beefy Nacho soup being prepped and ready for when we get home!